Back in 2017, we started the Scrum Master Salary Report 2017—the first industry report that covered in depth the educational background, working experience, industries, and organizational details of the companies Scrum Masters or agile coaches work for. For its 2019 edition—the Scrum Master Trends Report 2019—, we partnered with Scrum.org—the leading Scrum training and certification institution founded by Scrum co-founder Ken Schwaber—to improve the underlying data set. Learn more about the state of the industry and download for free the Scrum Master Trends Report 2019. The Scrum Master Trends Report 2019 is based on a survey of over 2100 participants—both from Scrum.org’s as well as Age-of-Product’s member and subscriber base. The report focuses on trends useful to both new and experienced Scrum Masters and reveals salary trends, agile adoption patterns, while also exploring gender equality within the Scrum Master role. The participants represent 87 different countries and come from all levels of experience. It is by all standards the most comprehensive analysis of today’s working environment of Scrum Masters and agile coaches worldwide. 81% are using Scrum with other agile practices, ie. Kanban, DevOps, XP. Scrum Masters with formal Scrum training and agile certifications have higher salaries than those without. Adoption trends show that 7% are continuing to use Waterfall while 11% are mature in their agile adoption; the remaining participants are early or growing their adoption. Female salaries are trending higher those of their male counterparts. Download the free Scrum Master Trends Report 2019—based on the replies of 2,100-plus individuals, from Australia to the United States—a joined venture of Scrum.org and Age-of-Product.com. Learn about salaries for Scrum Masters and agile coaches, educational backgrounds, careers paths, and why proper training and meaningful certifications are a good investment decision. Receiving a download link to this PDF by email. 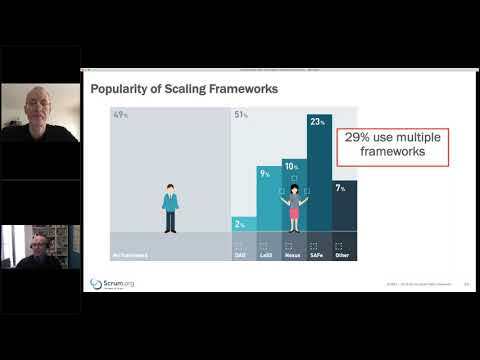 Note: If the browser will not start the video automatically, click here to watch the replay of the webinar on the Scrum Master Trends Report 2019 directly on Youtube. This is the mission behind the report: provide our community of Scrum Masters and agile coaches with the background information necessary to make career decisions. If you found the Scrum Master Trends Report 2019 useful, please forward it to a friend or colleague—it would mean the world to me! We will be back in Q3/2019 with the survey for the 2020 edition—please stay tuned until then.